This week in Explore we have looked at ourselves, written about adventures in our lives and made our own embellishments based on maps. On Friday, Shimelle's prompt included a selection of pagemaps to choose from to make a layout. I haven't done much scrapbooking lately so doing a layout was an adventure in itself. Mandy's embellishments and layout are really inspirational and I have been heavily influenced by what she had done. I scraplifted her ideas and I hope she will be pleased with my results. Her photo reminded me that I had photos that Roger and I took of each other on holiday in Northern Ireland in June. The Carrick-a-Rede rope bridge crosses a 30-metre deep and 20-metre wide chasm. The bridge swings as people walk across and you can see through the slats to the sea below. I was determined that I was going to do it and actually agreed to having my photo taken because I needed proof I'd done it. 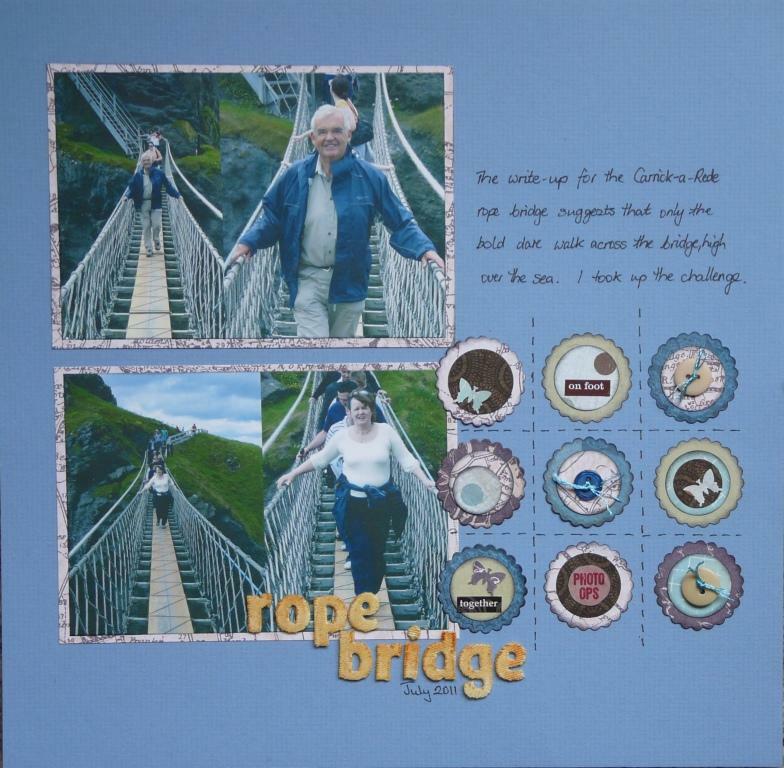 I love your layout about the rope bridge in Ireland. It look scary to me but then I am afraid of heights! I am also not a great fan of rope bridges, but I love the layout and the pictures. This is a great page and I'm pleased you got some ideas from my LO. It was such a fun week on Explore wasn't it?